For my first real use, I had a bowl I decided I wanted to re-turn the outside of so I mounted it on the vacuum chuck and as there was no centre mark, I relied on trial and error to get it centred with the bypass valve turned right down to reduce the vacuum to the point where I could move the bowl around. Once centred, I wound the bypass valve all the way up and turned and sanded the bowl. I was pleasantly surprised by the grip the chuck provided. I was being fairly cautious by taking light cuts but there was no sign of any movement between chuck and bowl. After I removed the bowl from the chuck, I noticed some small indentations where the bowl had been in contact with the chuck. I decided to check how much force I was applying by using the maximum 25″Hg vacuum with the 150mm (6″) chuck. The numbers worked out to around 350 lbs (160kg) of force – the weight of two people! Perhaps I had overdone it slightly! Re-working the sums showed with a 15″Hg vacuum, the 150mm (6″) chuck would still generate a holding force of 207 lbs (94kg) which in practice seemed to be more than sufficient and avoided the marks caused by overcompressing the seals. First the theory bit! Atmospheric pressure is taken to be 14.7 psi or 29.9″Hg. This is an average at sea level but is close enough for most of us to work with. A vacuum gauge reads zero at normal atmospheric pressure and if a perfect vacuum was achieved, it would read -29.7″Hg. For our purposes, we can ignore the negative sign as we can safely assume the direction of force is pushing the work onto the chuck. To calculate the force (I know the SI units should be newtons but I don’t have any of those in my workshop!) holding the work to the chuck, the following formula can be used. 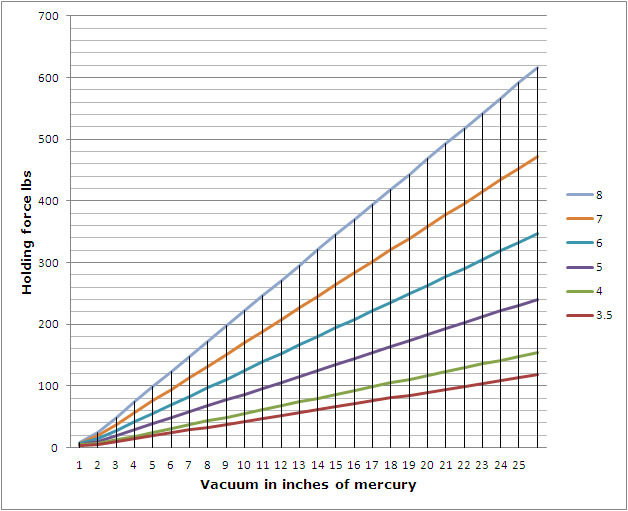 Where F is force, P is 0.49 (derived from mean atmospheric pressure being 14.7 psi or 29.9″Hg), A is the effective area of the chuck and V is the vacuum in inches of mercury. The graph below shows the calculations for a range of chuck sizes from 3.5″ to 8″ diameter.